Welcome to tazti online help. This page is divided into two sections: (1) Help and instructions for installation and setup, activation, and a basic guide for operating tazti and (2) frequently asked questions. For a detailed guide to operating tazti, please refer to the help file included within tazti. Control your favorite MMORPG or other PC games by talking to your PC. Works simultaneously with keyboard and mouse use. WOW, Guild Wars, Eve, Runescape etc. Tazti speech recognition software is designed to substantially reduce the number of keyboard keystrokes and mouse clicks you would normally make while using your PC. Ultimately fewer keyboard keystrokes and mouse clicks mean less stresses on your fingers, wrist, forearm and hand in general, and a more enjoyable computing experience. tazti utilizes an innovative speech recognition software design which when installed correctly allows your PC to recognize your voice and any spoken speech commands that you may speak. Your speech commands trigger actions on your PC. Examples include: saying the speech command “mouse click” which causes the mouse to click wherever you have the cursor pointing on your screen. Saying the speech command “mouse double click” causes the mouse to double click wherever you have the cursor pointing on your screen. Saying the speech command "go calculator" causes the calculator to open up onto your screen so you can use it to make calculations. tazti only works with Windows 7 (64-bit) and Windows 8 (64 bit). Please make sure you are running the a compatible version of Windows. Even though many new Laptops/Notebooks/Netbooks now come with built in array microphones, we've found through our testing that you will get best results by using either a standard plug-in headset microphone or a USB microphone. Most headset microphones come with speakers attached to the headset, making it useful for also listening to audio/music. Installation of tazti is very straightforward in most cases. tazti is available as a .zip (file type)download. tazti will perform a pre-install check to insure several components are installed before proceeding. If these components are not already installed, you will be asked to install them. Go ahead and agree to allow their installation as tazti will not install unless these components are installed. these components are: Microsoft Kinect Runtime, the Microsoft .NET framework, and related items. After the pre-install check is passed, and all required pre-requisites are installed, tazti itself will begin to install. You will see a window title “Welcome to tazti Setup Wizard”. Click the “Next” Button on this window. Another new window pops up, named “License Agreement”. This is your User’s License agreement with the manufacturer of tazti. Please read the License agreement in its entirety. If you agree with the License agreement click in the small circle labeled “I Agree”. NOTE: If you do not agree or do not accept the License agreement, the software will not install and you will not be able to use it. This window appears every time you install the software. Click the “Next” Button on this window. The next window of the Setup Wizard to appear shows you into which file folder tazti software will be installed. If you are an advanced user you can change the file folder, but new users should click the “Next” button on this window. The next window of the Setup Wizard to appear “confirms” you are ready to load/install tazti. Click the “Next” button to continue. tazti runs through a series of short processes to install the software. You can watch the progress on a horizontal bar in the window. This may take a moment or two. The installation process completes. You have now successfully installed tazti software. Click “Close” to exit the Setup Wizard. Double Click on the tazti icon or tile in either the start list or start page and tazti will startup. An introduction window will appear to tell you that tazti is starting. This will disappear after 4-10 seconds, then the main Control Window (dashboard) for tazti will appear. How many activations do I receive with each purchased tazti license? and What is a Floating License? Each tazti license purchased is a floating license that comes with two activations which can be used to run tazti simultaneously on two different PC's you own. Our servers track how many PC's you've installed tazti on and how many are activated. The floating license lets you move a installed copy of tazti from one of your two PC's to a third PC, just be sure to deactivate tazti first from the no longer wanted PC so our server knows it floating and available. Then you can use the floating activation on third PC. Same is true if you want to reinstall your operating system on a PC that tazti is installed on... Be sure to deactivate tazti before reinstalling your operating system so our servers show your activation available before you try to later activate tazti on the reinstalled operating system. What is activation and why should I activate tazti? 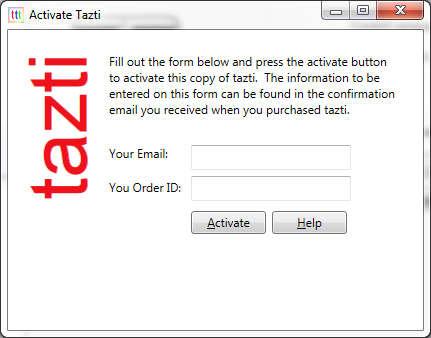 Activation occurs after a person purchases a tazti license. The person will use the order ID number(also called activation code) we provide you, to activate your installed and running copy of tazti. There are two differnt processes for activating depending if you purchased tazti via Paypal on our tazti.com website, or via a third party online webstore. See below for details. I have a 15 day free trial of tazti on my PC. Can I activate it? Yes! tazti 3.2.0 versions and later can be downloaded and run on a 15 day free trial. At the end of the free trial period the tazti software will time-out and lock until you purchase a license and activate the software. Some earlier versions of tazti included freemium and premium features. The earlier versions are no longer supported or offered. What is an "Upgrade" of tazti? An "upgrade" of tazti is when your 15 day free trial ends (if you have a trial version) and you purchase a tazti license and activate tazti. You can go to the tazti website to purchase your license. A link named "Purchase License" appears in the tazti application's "Upgrade and Activate" menu list. Clicking the link will take you to the tazti website's license purchase page. Why would I want to deactivate tazti (and what is a floating license, anyway)? There may come a time where you want to move tazti to a new computer, or you may want to change the operating system on your computer but still use tazti afterwards. The 'deactivation' feature makes this easy to do. Just deactivate tazti by clicking on the Deactivate menu item on the upgrade and activate menu list on the application when running, which frees up one of your two license activations. After you deactivate you can take the now available license activation and use it to activate your copy of tazti on a different computer, or activate tazti on the same computer after you've installed a new operating system and re-installed tazti. This is called a floating license, because the licenses float with you, and you can control or move the license activations from one PC to another PC. You can move tazti from PC to PC as much as you want, as long as the number of activated copies of tazti at any given moment does not exceed the number of activations available with the license you purchased. Be sure to deactivate before uninstalling tazti so our servers track the activations available to you correctly. Standard tazti license comes with 2 activations. Where do I look on the tazti application to upgrade(purchase a license), activate or deactivate tazti? The image below show the menus on the tazti application where you can upgrade(purchase a license), activate or deactivate tazti. How do I activate tazti? If you purchased a license to activate tazti from our website, you will have made payment via Paypal and you will receive an email from tazti.com that contains an Order Number(activation code) assigned to your purchase and the email address you used to make the purchase. You will need both the order number and the exact email address to activate your copies of tazti. You will want to print out or otherwise backup this email. If you purchased tazti through a third party website/online store your tazti Order Number/Activation code will be available for you to see in your online account in the webstore. You will need to enter the order number your retrieved from your webstore and also enter your current email address where we can contact you in the event of an issue with tazti. You will want to print out or otherwise backup the info in your online store. Paypal buyers (purchased through http://www.tazti.com): fill out the form with your Order ID and Email you used during the purchase. Third party webstore buyers: enter the order number retrieved from their account and also enter their current email address. Click the "activate" button. tazti will let you know if the activation is successful or if there was a problem. If the activation is successful, then you're done! You can immediately begin using tazti's features again once you've activated it, even if your version had a 15 day trial that had expired. Use the same Order Number and Order Email to activate as many computers as you have licenses for. Normally you get two licenses for tazti with each purchase, so each combination of Email and Order Number can activate up two computers simultaneously. Note: Once you activate tazti, the 'Activate tazti' menu will be greyed out, but the 'Deactivate tazti' menu will be un-greyed. How do I deactivate tazti? On the main dashboard of tazti, click the 'Upgrade & Activate' menu, then click 'Deactivate tazti'. tazti will popup a message to let you know when your computer has been deactivated. After you've deactivated a computer, you can always go back and reactivate it using the instuctions for activating tazti. Note: 'Deactivate tazti' menu will be greyed out until you activate tazti. Once tazti is activated, this menu will be un-greyed, and the 'Activate tazti' menu will be greyed out. Using tazti will help you eliminate thousands and thousands of keyboard keystrokes and mouse clicks in a year. tazti will open websites with Internet Explorer, Firefox, and Google Chrome. In general, when tazti tries to open a website, it will try to open it with whatever browser is set as your default browser. Using tazti is straightforward: simply speak a speech command and tazti will recognize your voice and perform the action associated with that command. This is an overview of how tazti works - please see the help included within tazti for a comprehensive list and details of its features. Be sure to plug your microphone into your PC before you begin. We recommend a headset microphone as tazti speech recognition works best when the microphone is one inch from your mouth and always in the same location relative to your mouth. For installation questions go to the "Installation and Setup" help page. When you turn tazti on, the "Welcome to tazti" splash screen will open for a few seconds. The Welcome screen just lets you know the program is starting up. If you have your speaker sound on, you will hear someone say "Welcome to tazti". When the tazti program is fully loaded, the application will open its main window which we also call a "dashboard". Let's take a minute and examine what's available to you on the dashboard. Menus - Horizontally across the top of the tazti platform you will see a listing of menu items. Now Using PC Mic: Allows you toggle back forth between using a headset mic and Kinect For Windows. By default, tazti will use the PC Mic. The Kinect For Windows feature is experimental and requires that you have the Kinect For Windows hardware, purchased separately. Buttons - On the left side of the dashboard. speaking the speech command "show tazti "
clicking on the open program button on the blue task line on the bottom of the screen with the title " tazti "
right clicking the mouse when the cursor is over the tazti icon in the system tray and selecting "show tazti "
On the left side of the dashboard above the buttons you will see the word "Listening" in green color or "Not Listening" in red color. This is actually a toggle button. If you place your mouse over it and click you can toggle between "Listening" mode, where tazti is active and listening to what you say; versus clciking again and going into "Not listening" mode, where tazti is muted and not listening to what you say. In addition the speech command "mute microphone" will cause tazti to go into "Not listening" mode and the speech command "activate microphone" will cause tazti to begin "Listening" again. You can use the speech commands interchangably with clicking the button. Remember tazti is always listening when it is in "listening" mode. If someone talks to you, it will hear them also and try to interpret their words into speech commands. If the radio or tv is running in the background, it may try to interpret that into speech commands. We always forget to turn tazti off when we get phone calls and it hears that also and tries to interpret what we say into speech commands. Therefore we recommend that when you are not using tazti or get interrupted by a phone call or people talking to you, place it into not listening mode. In general tazti should be used in as quiet a location as possible. In the center section you will see 3 tabs from left to right across the page. They are labeled: Custom, Control Games/Applications, and Options. Each tab has it's own help topics. For detailed instructions refer to the help sections for each tab. tazti in general, was created to reduce/eliminate keyboard keystrokes and mouse clicks as well as have fun. Therefore we've included the speech commands "Mouse Click" and "Mouse Double Click". You use these commands by moving your mouse and related screen cursor as normal to point at what you want to click. But instead of physically clcking with your hand, you say the speech command "Mouse Click" or "Mouse Double Click" into your microphone and it triggers the click ot double click action. The "Mouse Click" and "Mouse Double Click" speech commands are located on the Custom tab along with other Operating System related speech commands. Wherever you used to right click to bring up the context menu you can now use the speech command "Context Menu" to bring up the context menu related to where the cursor is pointed. (The context menu typically appears when you click the right button on your mouse when it is set as a right-handed mouse. The context menu has a different list of actions or info in it based on the application you are using, and not every application has context menus.) You should experiment with the "Mouse Click", "Mouse Double Click" and "Context Menu" speech commands to see how they work. What they do varies depending on what the mouse cursor is pointing at. In Windows, only one program at a time is considered the “active program”. You can tell which it is because its title bar (across the top of the window) is a brighter blue than any other open programs and it's button (along the bottom of the screen in the task bar) is the only button depressed in the task bar. Minimizing the active program hides it from view, and changes the button along the bottom of the screen in the task bar so it is no longer depressed, and makes a different program active. A group of custom speech commands will function no matter what the active window is and no matter where the mouse cursor is pointed. These commands are “Start Menu”, “Go Calculator”, “Media Player”, “Go Windows Explorer”, “Go Control Panel”, “Go Display Panel”, “Hide tazti”, “Show tazti”, “Quit tazti”, “Get Help”, "Mute Microphone", and "Activate Microphone". Say the speech command “Close Window” and tazti will close whatever is the active window, including tazti. Let me say that again in a different way. If tazti is your active window... and you say “Close Window”, then tazti will perform the first task to closing itself. It does give you the option to cancel the “Close Window” action. Experiment with the speech commands to find out what they do! Remember that when you use tazti, you will still use the mouse to move the mouse cursor/pointer around the screen. The list of speech commands lets you remove most of the keyboard keystrokes and mouse clicks that people have to perform during standard usage of their computer. In some cases you could save 100's of thousands of keystrokes and clicks a year! To start tazti click on the tazti icon on your desktop. Quit tazti button - on the left side of the dashboard. Click it to close tazti. 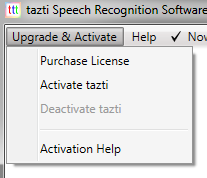 Speech Command "Quit tazti" - say the speech command and it causes tazti to close. Red X - You can always click the red X in the upper right of the window, just like any other window. Some versions of tazti may incorporate a 15 day free trial period. At the end of the 15 day trial period, tazti will lock and ask you to purchase a license to unlock it. Other versions of tazti may not have a 15 day free trial period and may require activation during first use. A microphone is required to use this software. We recommend a headset microphone as this controls the distance from your mouth to the microphone allowing for better hearing by the microphone. PC’s usually have a microphone plug built into them. Usually the PC manufacturers place an image/picture of a microphone by the correct plug on your computer. Check at your local computer or electronics store if you need a microphone headset for your PC. Speakers are not required and do not need to be a part of the headset, but most headsets come with speakers as well as the microphone making it easy to listen to music while at a cafe working on your PC. Some Laptops also come with built in array microphones, but headset microphones will give you the best results. Of course you must have a mouse or touch pad on your system. tazti allows you to set your mouse for left-handed use as well as the normal right-handed use. See the "Options" tab for this. You can always, manually click the mouse with your hand even when tazti is functioning. Your choice, hand or speech command! Please note that versions of Zone Alarm brand and some other firewall software may be programmed in such a way that you cannot use tazti to make any clicks while adjusting the controls within and directly affecting their firewall software. Adjustments to Zone Alarm will need to be made in the normal method of using your hand and mouse to make clicks. If you activate Zone Alarm pop up notifications, you will have to close any pop up notification by clicking the mouse by hand. Deactivating the notification function in Zone Alarm does not affect the integrity of the Zone Alarm operation. You can always turn the notification function on later. When using Microsoft's Vista operating system you MUST have your microphone headset connected to the PC BEFORE you open tazti. Iif you unplug your microphone headset while tazti is running and then later plug the microphone headset back into the PC, the PC may not recognize the microphone headset.... therefore tazti won't recognize you speaking. This can be solved by closing tazti and reopening the application with the microphone headset plugged into your PC.